Monday afternoon we had storms. There wasn’t a lot of lightning and thunder, but the wind was strong and it rained and rained and rained. It rained sideways, and waves of water ran down the street, and the sides of the street flooded a little bit. It didn’t flood like other nearby towns, but even the little bit seemed like a lot because usually we don’t get any flooding at all. I went on the porch and took a video of the rain. I’m sure you are not surprised. When the rain stopped, EJ and I took Danny for a walk. The world was soggy. At the end of our walk, when we were in front of our house, EJ pointed to a hollow knot in our maple tree a few feet above our heads. 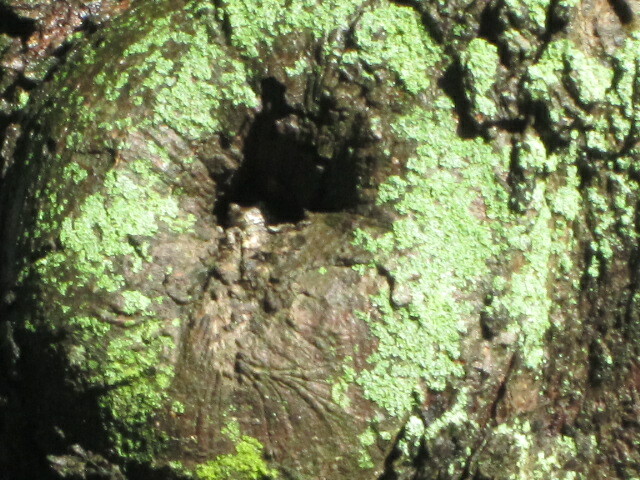 There was a tree toad in it. It was cute so we took a picture of him. You can just barely see him in the bottom left of the hole. This morning EJ and I drove to our friends to retrieve the truck. It used to be ours, and then it was our friend’s, and now the friend is selling it back to us. EJ stayed to visit with his friend while I drove the car back home. After I ate lunch, I cleaned out the car, took out the garbage, and swept the floor. Then I took Danny for his walk. We went for a slightly longer than usual walk–out to the Village limits and back. I’d like us all to work towards walking a mile out of town and a mile back so we can get more exercise. A face cord of wood. Eventually, EJ returned home. He ate and then we drove to buy a face cord of firewood. 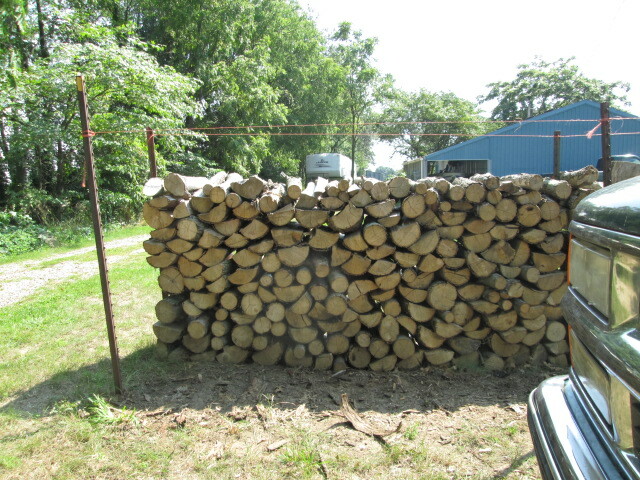 For those who don’t know, a full cord of wood is a stack of wood four feet high, eight feet long, and eight feet wide. A face cord is a stack of wood four feet high, eight feet long, and only 16 inches deep (one piece of firewood deep). Where we live, people cut trees down on their land, saw pieces into 16-inch lengths, and stack it in racks near the road for people like us to buy. We have a couple of places we buy wood from. This picture is from last year, but this is the same place we bought wood today. The man was selling black walnut today, which EJ says is very good firewood. We need at least 10 face cords of wood to heat our house over the winter. EJ and I loaded the wood into the truck, drove it home, and then unloaded the truck and stacked the wood in the woodshed. It felt good to work so hard. One down, and least 9 more loads to go. At sunset this evening I was doing dishes when I noticed the chimney swifts circling. At sunset during this time of year, thousands of chimney swifts circle round and round an old school on the other corner of our block that was turned into an apartment building. A sweet 90+ year old lady that I used to go to church with attended the school when she was a child so the building is very old. She was a widow and a few years ago she married her childhood sweetheart, who also had attended the school. We attended the wedding. It was so sweet. I’m not sure just when the old school was turned into apartments–but it was long before we moved here. Anyway….each time the swifts circle around the building, some drop into the chimney until finally they are all inside. It’s really cool to watch. The first time I saw them, years ago, JJ and I thought they were bats. Each year we like to walk down the street at sunset to watch them. EJ and I walked down this evening so that I could video the sight. By the time we got to the building, many of the swifts had already dived into the chimney but there were still thousands flying around. And again I heard your voices that was sooo cool just as the video about the birds in the chimney. Ik hope that the people who live in the building can sleep with all that bird noise. But it was really cool just as the other one with the rain I love rain…..wonderful to read about your part of the world Teri that is a blessing. Normally I do not like to speak, but I kept thinking, “Simone always likes to hear us” so I talked during the video. I love the rain too and the birds are really awesome! But I really do wonder what the swifts sound like to the people in the apartments. I only see the swifts gather like that for a short time in the autumn so at least they don’t have to endure it all the time.